First up, on Saturday 14th May, campaigners from Young Friends of the Earth Northern Ireland and Fossil Free QUB publicly presented a "Portrait of BP" - an image of an oil-drenched pelican - inside the Ulster Museum in Belfast, in protest at the museum's hosting of the BP Portrait Awards. Photos here. Then on Tuesday, Art Not Oil member group BP or not BP? 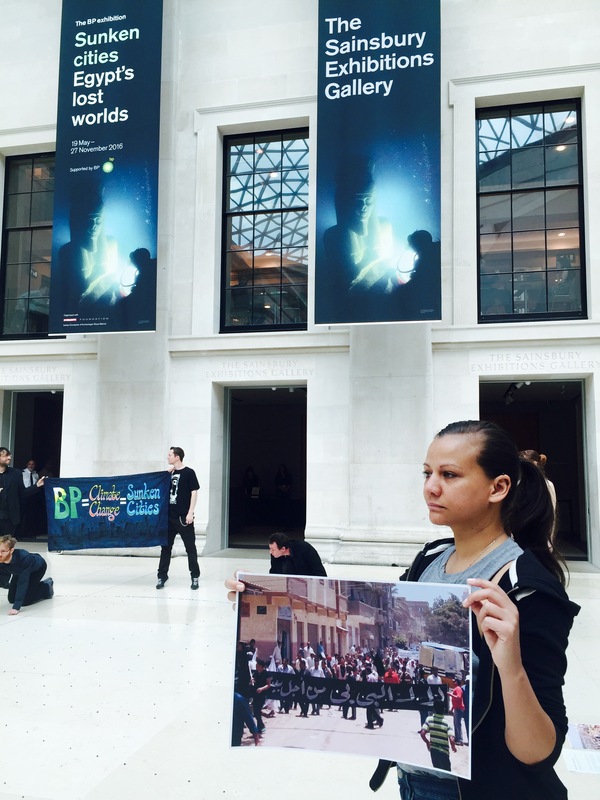 carried out two creative protests inside the British Museum, to challenge BP's painfully ironic sponsorship of the new "Sunken Cities" exhibition. The first performance took place at 10.30am, when the entrance to the exhibition's official press launch was partially obstructed by a "disobedient artwork", in solidarity with people standing up against BP's activities in Egypt (the source of the exhibition's artefacts). Full story here. The second performance took place in the evening, to coincide with the VIP launch party for the exhibition. Performers successfully occupied the Great Court of the museum from closing time onwards. They drenched themselves with water to mark the loss of future cities to climate change, and performed loudly enough to be heard inside the launch party (whose attendees included representatives from BP and the Egyptian government). Full story here. Then on Wednesday night, performers from Art Not Oil invaded the BP-sponsored Royal Opera House screening of the new Frankenstein ballet in Trafalgar Square. Dressed as oily monsters, they addressed the crowd during the interval and then, in the final act, guerrilla projectioneers Feral X shone the words "Drop BP" down Nelson's Column. You can see some photos here. Today, the public opening of the Sunken Cities exhibition has been disrupted by Greenpeace climbers, who have scaled the British Museum's front columns to drop banners naming some of the world's "Sinking Cities". More information and a new Greenpeace petition here.